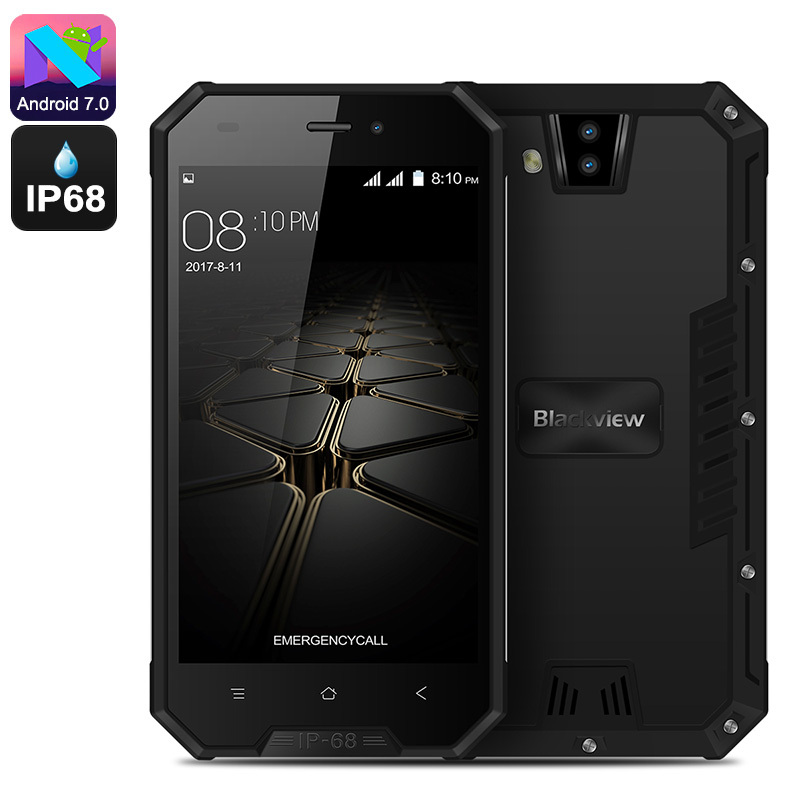 Successfully Added HK Warehouse Blackview BV4000 Rugged Phone - IP68, Dual-IMEI, Android 7.0, Quad-Core, 3G, HD Display (Black) to your Shopping Cart. The Blackview BV4000 is an affordable Android phone that keeps you connected anywhere you go. It features an extremely tough IP68 design. Thanks to this, it can be used in virtually any environment as it is resistant to water, dust, and drops. This makes the rugged Android phone perfect for people such as factory workers or miners that work in rough environments. Additionally, it is a great outdoors phone that keeps you connected while heading out into the wild. The smartphone comes with different outdoor features such as a GPS as well as a powerful 3680mah battery. This cell will get you through days’ worth of usage time without you needing to recharge. This rugged smartphone runs on Android 7.0 thanks to which you’ll be able to use the latest software features. With its sophisticated Quad-Core processor and 1GB RAM, it can handle all the basic applications out there. You’ll furthermore be treated to 8GB ROM and a 32GB SD card slot. This should offer you great convenience for storing all the latest Apps, games and movies. All your favorite media can be enjoyed on the phone’s crisp 4.7-Inch HD display. It is equipped with Corning Gorilla Glass 3, meaning that you won’t have to worry about scratching your display while using it outdoors. Dual-IMEI numbers treat you to great connectivity. This rugged Android phone lets you slide in two SIM cards to which you can stay connected both at the same time. Therefore, you’ll always be reachable on two different phone numbers while you only use one smartphone. This makes the Blackview BV4000 perfect for those of you who wish to separate work and private life with one device. Additionally, your Android phone treats you to 3G, meaning you can browse the web virtually anywhere you are. The Blackview BV4000 rugged phone comes with a 12 months warranty, brought to you by the leader in electronic devices as well as wholesale smartphones..